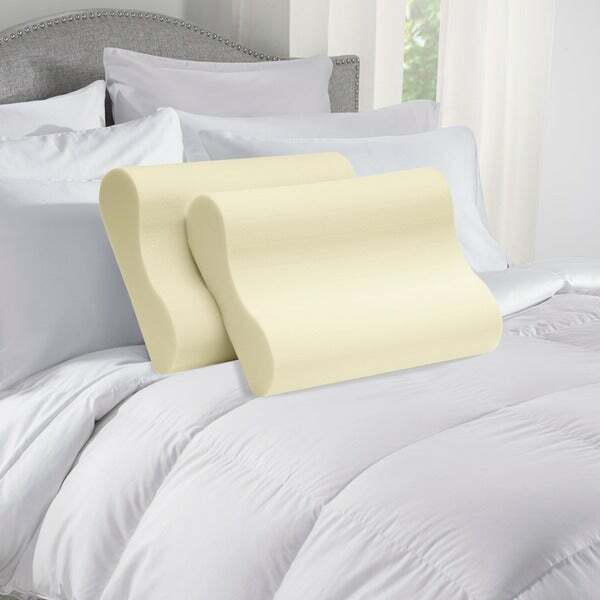 This memory foam pillow set is engineered and designed for comfortable support of your head and neck, the two contoured pillows in this memory foam pillow set make an ideal choice for both side and back sleepers, as they reduce uncomfortable pressure points and assist in proper spinal alignment. Remove from packaging within 72 hours to maximize foam expansion. This product arrives very tightly packed. Unwrap and allow 48 hours to return to its original shape. Being sealed in plastic packaging sometimes traps odors; allow product to air for a few hours. Conveniently arrives tightly packed in portable box. Due to the nature of memory foam, the firmness level of similar products may produce different firmness results. As others have noted, these pillows don't look to be very substantial. Don't be put off by their appearance. Rest assured (pun intended), these pillows are *comfortable*! They provide excellent support. After the first night I slept on them, I woke up the next morning without my usual neck cramps or lower back pain. Having used them now for over a month, I can say that these pillows were the best purchase I've made in a long while. i feel this memory pillow is great for your body'no pressure points and it's very confortable. I'm a retired neurosurgeon and treated neck problems for 30 years. These pillows are supposed to support the neck and give relief from painful degenerative joint disorders such as arthritis. They don't. They are too thin. I know. I suffer from cervical osteoarthritis. I'm a side sleeper and during the night my head sinks too far into the memory foam, bending my neck to the side and leaving me with increased morning neck ache. They need to be about twice as thick as they are. I gave mine away. I've been using this pillow for the past few weeks and I've noticed a better night's sleep than previously. I sleep longer with less twisting and turning. The memory foam pillow is very comfortable and cushy. You can feel it mold around your neck and head where it does not become flattened. It is the right amount of support. Upon receiving the pillow in the mail I did notice a slight smell from it being new but I aired it out for a few hours and was able to use it. The first few nights I slept like a baby....I don't think I even turned or twisted one time but now that I am used to it I do still twist and turn but definitely not as much as I did....I am one of those turners who twist about 100 times a night. I can sleep on my side comfortably.....there is enough support for your neck and shoulder so that when you lay on your side you are still comfortable. We love our memory foam contour pillows. When these pillows first arrived they had a slight odor but I took the cases off and aired them for about 48 hours and it vanished. I absolutely love these pillows. They are just the right height and are perfect if you are a side or a back sleeper. I would recommend these to anyone looking to try a memory foam pillow. My husband loves them too. We are happy sleepers! I have had this pillow for a few weeks now and I love it. The first night I was unsure about it. Like a few of the other reviewers, this pillow does come with a smell. I washed the covers and while they washed I let the pillows sit outside in the fresh air for a few hours. Once the covers were washed and I added my own pillow case the smell subsided. I was not sold on the contour shape of the pillow - I had always had doubts about contour shapes and really thought I just wanted a pillow that my head would sink into. However, after reading other reviews I decided to give this a try. I am glad I did. I normally sleep on my back and my side. On my back the small contour fits perfect under my neck and provides the perfect amount of support. And on my side the "hump" is small enough that I can still be on my side and also have some cushion. I have not woken up with a headache since I began using this pillow. I will admit the first night I was not totally comfortable with this pillow. If you are like me and have never had a contour pillow it does take a night or two to get used to. However, after a few nights I can honestly say I will not go another night without it. I looked for about 3 weeks at different websites and in different stores to find the perfect memory foam pillow and for the price and the fact that you get 2 pillows you will not find a better deal!!! I'm not a doctor, just a person with a herniated disk in their neck. I had a thin latex pillow for years which finally gave up the ghost and I have purchased 5 or six pillows over the last year, trying to find one that allowed my head to rest in neutral position, not cocked up at an angle, causing my neck to spasm and make my night miserable. During a massage therapy session, my therapist placed a "memory foam" pillow under my head as turned onto my side. I new immediately that I had to get one. I ordered this pillow set based on price and reviews. Thy arrived in a single box, and in a plastic bag. I let them sit in the open for a few hours after opening and they regained their proper shape. After just a few nights of getting used to the density and which edge to place under my neck for the best support, I was sleeping well on them and now really appreciate and enjoy the comfort and "fit" they provide. No more waking up wincing, flopping around trying to make the fat, non-conforming pillows I had been using into something they weren't. There may be better memory foam pillows, but based on the reviews I've read, it doesn't appear so, without sending much, much more. As with ANY memory foam product - you should open the product and allow it to "air out" for two days before you "cover it". This will allow the chemical smell to evaporate fully. Since this pillow is slightly thinner it allows better head support without tipping your head forward. Slightly smaller size is ideal for travel. These are great pillows for SLEEPING - not meant to dress up your bed. The secret is to AIR IT OUT FIRST. I usually get a lot of pain and tension in my neck, upper back and shoulders mostly due to stress but also from sleeping on regular pillows. I was a bit skeptical about these and really didn't think that they would help. Receiving them made my skepticism even worse as they feel very cheap of very low quality and nothing like popular brand name memory foam pillows. I was fixing to send them right back immediately and didn't even start to use them until days after receiving them. However, since sleeping on these pillows I can honestly say that I no longer have that annoying pain in my neck, shoulders and upper back anymore. When I'm stressed at work I actually look forward to going home just so that I can sleep on these pillows knowing fully well that I will wake up the next morning with no more pain. I honestly didn't think that such a simple thing would be the cure of my pain. The cons: They are very low pillows so if you like to sleep with your head elevated these are not for you. They feel really cheap and the color changes to a yellowish color very quickly. I would recommend putting a cover on these before putting on your pillowcases. They feel a little stiff when you first receive them but they do soften up a little over time. It will take some time to get used to sleeping on them as my first two nights were a bit uncomfortable even though I was so tired that I was able to fall asleep on them. They even made me feel a bit nauseous the first couple of nights I guess because it was aligning my spine and my body wasn't use to that. (I know it sounds like it doesn't make any sense but if you try it you might experience what I'm talking about.) Overall I would highly recommend these pillows. They're a fraction of the cost of what you will pay for popular branded memory foam and they get the job done. You can get a cushioned cover to put over them and then put your pillowcase on to make them more softer. *Ive bought several things from Overstock.com including an excellent memory foam mattress topper and theyve always been excellent until now! I dont know what kind of foam this is but its almost not quite exactly NOTHING like memory foam. There are remnants of blue cloth labels in the seams of the covers and another label sewn in that says they are made for *****. If I was ***** Id be ashamed to have my name anywhere on these pillows. They are flat and hard and do not yield at all to my head. After getting my neck and shoulder pains back I returned to my old pillow which I made up of a double layer of extra memory foam mattress topper I only needed a full size but since there was no price difference I bought a king size that Id bought from Overstock a few years ago. I used the cover from one of the pillows I do think these pillow covers are rather nice and I put both of these Memory Foam sic pillows into the other cover and I use it for my back on the couch. Since I paid for these pillows with a gift card Im only out $**** so its not worth it to me to return them. Oh well. The pillows were exactly what we expected when they arrived. 2 ***** memory foam pillows tucked into a box that expanded as soon as we took them out. Odor was on pillows for about 3 days then went away. The smell was not to strong and did not disturb my sleep. My boyfriend loves his they do take some getting adjusted to as they are not your average pillow. Overall i would recomend them. I was disappointed with the SIZE of the pillows. They are very comfortable however the picture in the advertisment led me to believe they were standard pillow size. Upon delivery I found them to be a mere 3 three inches thick and 20 twenty inches in length. The raised areas at the top and bottom which are supposed to support the neck were a bit to "hard" for my liking. I know they are meant to be supportive, but they actually hurt. The pillow portion within the raised areas is not as firm as it looks in the picture. That portion was a little too soft. ...these are not decorative pillows or big fluffy sitting-up-in-bed pillows, but they do accomplish the purpose for which they were designed: sleeping on. I didn't even know I had any sort of problem, just bought them for fun, but after sleeping on one for three days, I went to my weekly massage and the masseuse said, "What happened? Your neck's not all screwed up like it usually is." Who knew? Initially, they seem a little hard, but I guess I have a warm head or something because they soften up right away and are extremely comfy. I was taken aback at how small the pillow was even tho I did know the measurements before I bought it. I've used the pillow over a week and I do like the way it "cradles" my head. The pillow doesn't look at all like the picture. The middle is only about 2 inches thick, so when you put your head down on it, it sinks and there isn't much padding underneath, so keep that in mind. The price was right. If I paid more for it, I wouldn't be very happy. I can't say I sleep any better with it. They are too hard, or firm. No cover for them. I have purchased pillows in stores are are more comfortable, cost less and have a nice zipper cover on them. I definitely would not recommend these pillows. It is a very comfortable pillow since I used it my husband stopped snoring. I was worried about these being good. They are great. A perfect balance of support and comfort. Regular pillow cases work fine for us, I hated shoving the old ones in the zipper covers anyway. They are a nice size and have a good depth to the shape. It did take them2 days to air out but I can’t detect any smell now. I would recommend as they were a reasonable price compared to buying in store. These touch of comfort memory foam pillows are awesome! They cradle your head and neck so that you have don’t have neck pain when you wake up the next day! I wish I these came with covers. And they are a little too rounded compared to other contour pillows. They are pretty good to sleep with but not the best. I gave them 3 for the shape and the lack of a cover. Odor dissipated in a few days, but density is way too soft. Size doesnt work with standard pillow cases. I put both in same pillow case and it works better. ""What's the shipping weight for the full set of 2?"" "Some people here says 'Yes it comes w/ covers', & some say 'No it does not come w/ covers'. Which one is it!?! I noticed that the picture does Not show cover!! I would like to have covers on them, & if not, can I buy the covers separately." Good day, Having recently purchased this item I can tell you it doesn't come with any covers whatsoever. The pictures themselves don't show a cover either, so at least it's not false advertisement. Really not sure why anyone who purchased this exact item would state they included covers. You'll definitely want to purchase yourself 'standard size' pillow covers as these contour pillows are standard dimensions. Hope you have a wonderful day! No covers came with it. We just put regular pillow cases on them and then another one over the first one so we can take that one off and wash it. Ours are pretty firm and they are a bit hard to slip into the pillow case. That's why we use the outer one, makes it much easier to slip off and on. Ours did not come with covers. We use queen size pillow cases as covers. "how thick is the pillow? is it soft memory foam material or hard one?" The pillow is about five inches thick and yes it is soft memory foam. I have had mine for five months now and love it. Very good neck support. I no longer have neck pain. Excellent pillow for back sleepers. "Is one pillow softer than the other?" Both pillows are the same firmness. "is there any way to wash this type of pillow?" Hello purplezebra1, unfortunately, this pillow cannot be laundered. Thanks for shopping with us! I use 2 pillow cases on mine. It might be overkill, but since it can't be washed, I'd rather have another layer that I can toss in the washer. We have memory-foam pillows now, but needed a different type of memory-foam style pillow. "I ordered these pillows based on the answer from overstockcustomercare1 stating the pillows came with covers. I received the pillows today and there are no covers." Hello canooler, I am so sorry. I looked at many reviews on this product to find my answer. They must of stopped making covers for them at some point. Thank you for letting us know this information. If you need any further assistance please let me know. Have a great day! I encountered the same problem. I now have the pillows but no covers. That's disappointing. these pillows do not come with covers.